I have another brusho sky to share today. On Monday I explained how sometimes I paint the sky first, other times the images are done first. To create the appearance of snow on these twigs I had to stamp the twigs first. I used the misti and stamped the ‘into the sky’ stamp in versamark first then moved the watercolour panel up ever so slightly and stamped the twigs again in versafine onyx black. I then embossed with clear powder so the images would resist the paint when I added the sky over the top. I used three colours of brusho to create the gradated sky leaving a bit of white at the bottom like a cloud. 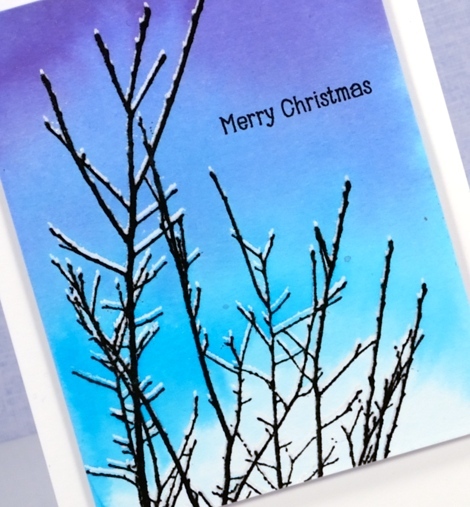 I finished the card by adding a simple sentiment and popping it up on a white card base. Oh wow, this is stunning Heather. Thank you so much for describing the process. So lovely! 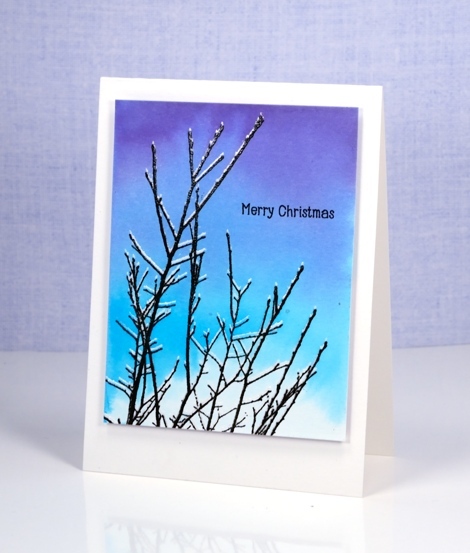 I’m hoping to do your November card class; I think there is something similar in that workshop? So stunning and the yet the technique is not complicated. I am always in awe of and inspired by your work, Heather. Thank you for sharing. As I so often seem to say when I see you use this technique… I really must try it! Beautiful background sky and card, too. Hi Heather, I love your projects. Saw this first on IG and came over here to ask a question. I read your description and understand the basic steps, but how did the “snow” get to be white if you used clear embossing powder? OH wait, was it because this was the very first step and the paper is white??? Geez, maybe I’m not as dumb as I thought! HA HA. Gotta try this!